Years ago I took Phthalo Blue out of my regular palette because I have difficulty with it. It’s a personal thing. Doesn’t mean it’s a bad colour to use — it just means I’m not good with it. I guess I’m more comfortable using the cooler blues like Ultramarine and Cobalt. But sometimes it’s good to switch things around, use a different range of colours and see how things go. I haven’t been entirely happy with my mixed greens either lately so today for my tulip experiments, I used mostly Winsor Yellow and Phthalo Blue (and red of course) but no Sap Green. I was much happier with the results. I always find tulip foliage hard to match. The stems are pale yellowish/green but the rest of the foliage can veer towards the blue. You can see from the little test strip that I did that these greens will be perfect for the spring landscape too. …but in this one I just used Phthalo. Just beautiful! I prefer the one with that cerulean blue; however, I love the ‘tangled’ look of the foliage in both. Thanks Susan. Of course the other part of the experiment, besides the blue, was the different styles of paintings. They’re both amazing…you’re so talented. I’m glad I had some time to experiment with this today. I’m a phthalo blue fan, myself…I love the way it makes deep, dark colors. Love your tulips too! I love the deep darks you can get with it too but I am not great at having it mix with other colours. That’s always when I run into trouble. I share your experiences with Pthalo blue. It can be so consuming and I think it’s hard to control. I love these paintings, especially being able to compare the different blues. Awesome. Thanks Carol. It seems that so many people have trouble with this colour. Glad I’m not alone. Hi Shari, I usually avoid Pthalo blue too because it is so staining. And never in en plein air. For me the problem is I have to wash my brush with soap before I can use it on a warm colour. We seem to have a consensus in the comments area Garry. Everyone has tried it we all have difficulties. And so true with the brushes. I have some Escoda Perla white synthetic brushes that are completely stained from this. LOVE that middle one.. and thanks for your thoughts..
i was taught and read that ultramarine blue was warm. Am I wrong? Thankyou for the colour lesson. Both paintings are beautiful. 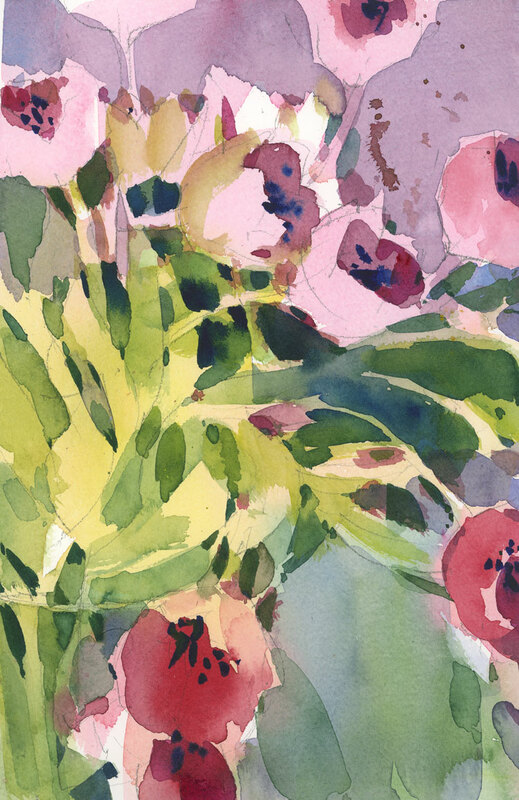 There’s a British botanical water colorist, Billy Showell http://www.billyshowell.com/ , who mixes in Phthalo blue to make some great greens. Love your tulips Shari. I always think of ultramarine and cobalt as being cold blues, although I know technically they are warm because they vere towards red on the spectrum and in my head prussian blue and other greenish blues are warm although again technically they are ‘cold’. I’ve always found that confusing, I know I’d rather dive into a greenish blue swimming pool than an ultramarine one…. I love Phthalo Blue, but it must be mixed and tone down most of the time. There’s no brighter blue than that. I love Pthalo blue, but it does give a socko punch if used full strength. I often reserve it for deep shadows. 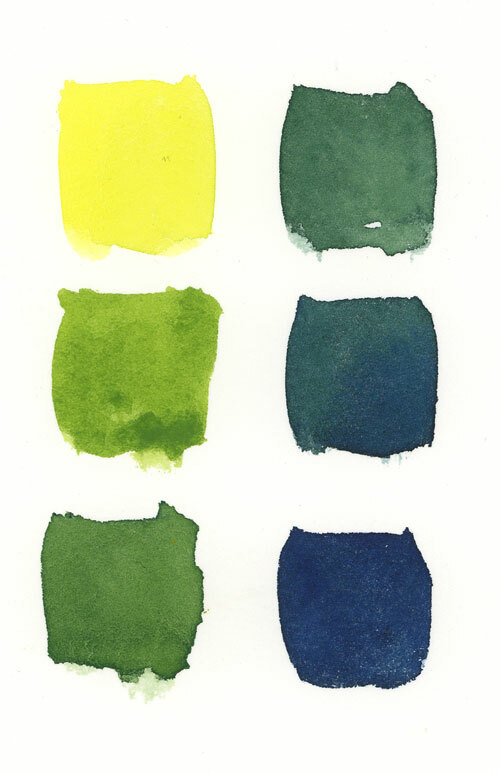 I recently added in a new gamboge yellow to my palette, and find that mixing it with ultramarine blue makes a less-intense green that I like for foliage. When I want a yellow-chartreuse hue, I’ll use Hansa Yellow instead.